Sending the Liaoning through the Taiwan Strait may signal China’s displeasure, but in military terms is an irrelevance. Measured in terms of Chinese rhetoric, the temperature of cross-strait relations has risen sharply this week. Addressing China’s National People’s Congress, President Xi Jinping warned Taiwan that it would be “punished by history” if it declares independence. This comes amid an intensifying pressure campaign by Beijing to isolate Taiwan since President Tsai Ing-wen’s pro-independence Democratic Progressive Party administration was elected in late 2016. Beijing’s ire has been aggravated by a recent step-up in US governmental engagement with Taiwan under the Trump administration. This is codified in the Taiwan Travel Act, which passed Congress last week and “encourages visits between officials of the United States and Taiwan at all levels”. As a pointed manifestation of US engagement, Deputy Assistant Secretary of State Alex Wong delivered a speech at the American Chamber of Commerce in Taipei yesterday, with President Tsai in attendance. The mainland must also prepare itself for a direct military clash in the Taiwan Straits. It needs to make clear that escalation of US–Taiwan official exchanges will bring serious consequences to Taiwan. The newspaper suggested that China “can send military planes and warships across the Taiwan Straits middle line”, referring to the de facto maritime border. In this increasingly febrile context, it is tempting to see the transit of China’s sole aircraft carrier, the Liaoning, though the Taiwan Strait this week as a show of force intended to intimidate Taipei. Sending the Liaoning through the Taiwan Strait may certainly be a calculated signal of displeasure from China’s military and political leadership. But in military terms, it is an irrelevance. According to the Chinese-language Lead Story on Military Affairs, at approximately 8 pm on Wednesday, the Liaoning entered the north-eastern part of Taiwan’s Air Defence Identification Zone (ADIZ). It sailed close to the middle of the Taiwan Strait, but stayed on the western side of the median line. By midday on Thursday, the Liaoning reportedly left the south-western part of the ADIZ and continued south-west, in what was deemed to be a training drill by Taiwan’s Ministry of National Defence. The Liaoning has reportedly entered Taiwan’s ADIZ to conduct drills on three separate occasions (in 2013, 2016, and 2017), when it also stayed on the western side of the median line. Although Taiwan’s military has closely monitored the Liaoning’s progress, the Ministry of National Defence noted there were no “unusual developments”, describing the ship’s presence as “routine”. None of the reports indicated that the Liaoning undertook flight operations during its transit of the strait, which would have indicated an active and provocative attempt to probe Taiwan’s air defences. China’s first aircraft carrier is best regarded as a training ship for carrier operations. It is certainly not a strike carrier, as the J-15 aircraft that constitute its air wing are not capable of being launched from the ship’s deck with more than a light load of air-to-air missiles. The ship’s military function is predominantly for training, with some air defence capability. With barely 180 kilometres separating Taiwan from the mainland, the island is already well within the reach of China’s land-based offensive and defensive capabilities, many of which are deployed in deliberate proximity. There are concerns that if in future the People’s Liberation Army fields the Russian-made S-400 surface-to-air missile system on the Chinese side of the strait, this will cover the length and breadth of the island. Sending a fledgling aircraft carrier without strike capabilities through the Taiwan Strait contributes nothing of significance in military terms, except exposing Liaoning to additional scrutiny from Taiwan’s military surveillance. 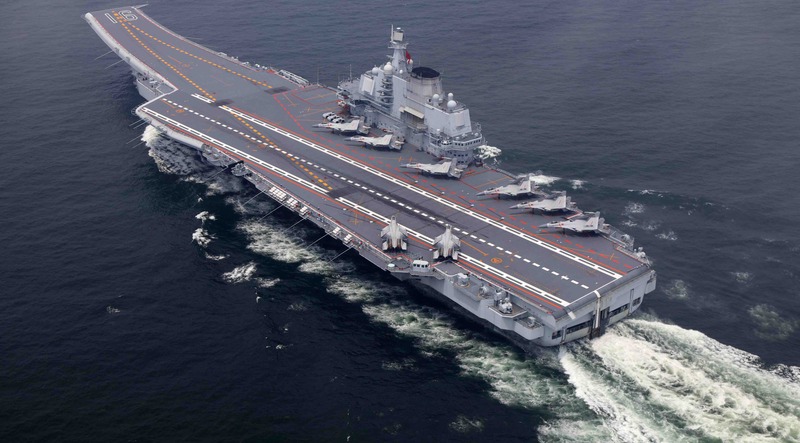 In wartime, Chinese aircraft carriers would be dangerously exposed. Arguably of much greater significance for future confrontations at sea was news reported by the South China Morning Post on Thursday that China’s coastguard, previously under the control of the now-defunct State Oceanic Administration, has been placed under military command, via the People’s Armed Police. This represents a retrograde step from the viewpoint of civilian control over China’s maritime law enforcement. More ominously, it suggests China is prioritising organisational changes designed to streamline PLA command and control for war-fighting purposes. According to a Chinese expert quoted by the South China Morning Post, this measure “could remove some of the diplomatic leeway China had in handling conflicts”, by removing “the buffer of a non-military authority”. Nevertheless, “the confirmation of the party’s absolute control over the military and the consolidation of all armed forces is a higher priority”. How easy a task that would be remains to be seen. The Liaoning’s transit through the Taiwan Strait this week is a military irrelevance. But make no mistake; China’s president has set his sights on achieving reunification with Taiwan, by force if necessary, before he leaves office. Rhetoric aside, analysts should take greater heed of China’s organisational war preparations in this context.